I am a passionate crafter, but I didn't have a lot of time to this. Lovely. I like those things. In my opinion that is a kind of a good present for child. Hearts Craft is a great post which you have shared here. I am very happy to read this article. I found it very informative and interesting also. We have must think about the significance of sound things for our wellbeing. It is just conceivable in the event that we are teach and we find out about these things. Instruction is vital for carrying on with a solid life. You can meet our master scholars through uk dissertations site and get change in your composing result. This would be a great little project for people on the go. 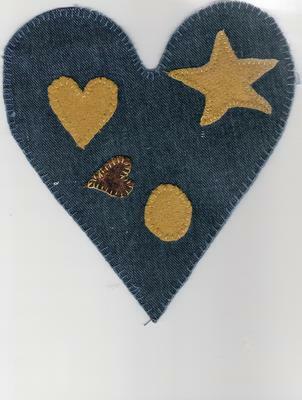 Depending on the size, you can use it as a pin, add it to a vest, or would make a great gift tag. Children can use them to decorate a tree.